Share this groundbreaking moment in American History to inspire more women to get politically active and pursue leadership roles. 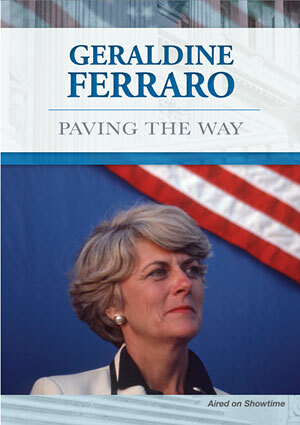 Geraldine Ferraro: Paving the Way is a documentary about the life of the trailblazing woman who made history in 1984 as the first female Vice Presidential nominee on a major party ticket in the United States. The film profiles Ferraro's life and legacy, from the struggles she endured while growing up, to the hurdles she faced and overcame both professionally and personally in order to achieve what no woman had done before in American history. The primary focus of the film is Ferraro's public service and political career, from District Attorney in Queens, NY, and later respected member of Congress where she fought for equal rights, to the highly emotional night of her Vice Presidential nomination, followed by the tough campaign that followed. The film explores how Ferraro's landmark nomination and her conduct during that campaign changed the national perception of what was possible for women. With insider access to leading political figures, including Hillary and Bill Clinton, former NBC Today producer Donna Zaccaro, created a revealing personal portrait of her mother, a woman who changed the face of American politics forever. - While women have made considerable progress in gaining election to public office since Ferraro's pioneering nomination, they still only occupy 24% of state legislatures, 10% of governorships, and less than 20% of the U.S. Congress. -American women occupy almost 52% of all professional-level jobs, yet lag substantially behind men in holding leadership positions-comprising only 14.6% of executive officers and 4.6% of Fortune 500 CEOs. "Fascinating...the film reminds us Ferraro's nomination was every bit the milestone." "Her candidacy was a seminal moment in politics that was validated by the subsequent leap in the number of women holding office. In three decades, political women have gone from anomalies to mainstream, though they still are underrepresented." "Ferraro's campaign eased America's long-running doubt that a woman could be accepted at that level of national leadership. She reset the bar at a place from which it couldn't be lowered."